With great popularity, comes greater risks. Recently, Bollywood diva Disha Patani was trolled for copy-pasting the caption to her Instagram post. A similar goof-up was made the popular ‘wink sensation’ Priya Prakash Varrier, who enjoyed the overnight fame and stardom. The actor enjoys a huge social media following with nearly seven million followers on Instagram. Well, with followers so many, one wrong move and you can be the victim of heavy trolls! Priya’s now-deleted post which went viral for all the wrong reasons has invited a row of trolling. Sridevi Bungalow Teaser 2: Priya Prakash Varrier Starrer Showcases Her Character's Complicated Love Life (Watch Video). 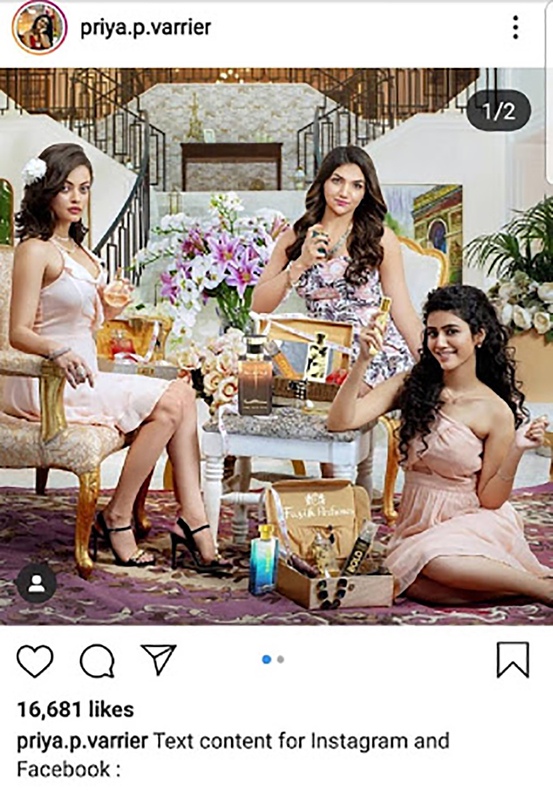 The Malayalam film actor recently shared a promotional picture for a perfume brand but what caught the trollers’ attention was the caption. The post attracted many savage comments on Instagram. The goof-up was immediately rectified by the actor and the caption was later edited. However, the cybernauts were quick enough to notice the mistake! On the work front, Priya will be making her big Bollywood debut with Prasanth Mambully’s Sridevi Bungalow. The film is, however, stirring controversies as it is claimed to cash in on the popularity of the legendary actor Sridevi.